If you would like to access the Code of Conduct on your mobile device, download the app. This provides quick and easy access to the Code so that you can reference it any time! Need to view the Code in PDF or access translations? 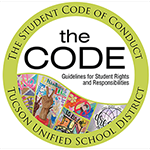 Visit www.tusd1.org/TheCode. Ready for your mobile device! Now available on Google Play! Coming soon to the iStore!